It’s 3:30 am, I hear the wakeup shouts coming from outside my tent. This is it, today is the day. The only thing between me and Intipunku (“the Sun Gate”) are four more kilometers on the Inca Trail. Soon I will witness the first warm rays of sunlight as they slowly illuminate the Lost City of Machu Picchu. I have played this moment over and over in my head for the last 4 days since I first set foot on the Inca Trail. Hiking the Inca Trail has been a dream of mine for years. But now, this dream has become reality. I’m in Peru, experiencing this interesting South American culture and challenging myself with this impressive task I have dared myself to achieve. I arrive in Cuzco with a day to spare before starting my G Adventures Inca Trail tour; enough time to acclimate to the high altitude environment of this region. Cuzco, considered as one of the highest cities in the world, is located at approximately over 3,350 meters above sea level (10,990 ft). It’s no surprise why altitude sickness is a common factor among tourists who wander around this thin-aired city. As soon as I arrive at my hotel, Prisma Hotel, I quickly drink a cup of coca tea to reduce my altitude sickness symptoms – headache and shortness of breath. A couple of coca teas later, I feel ready to wander around the ancient capital of the Incan Empire; visiting churches, picturesque alleys, markets, and public squares. The next morning, I and my other G Adventures companions officially start our Inca Trail tour with what I consider a “warm-up” day on the Sacred Valley of the Incas. The valley is generally understood to include everything between Pisac and Ollantaytambo; a lush agricultural region, parallel to the raging Urubamba River, that continues to supply the city of Cuzco with much of its produce. This first day at the Sacred Valley is perfect to continue acclimatizing and to provide a smooth transition to the heavy hiking activity that will be performed at the Inca Trail. Our first stop is at the Planeterra Project at the Ccaccaccollo Community. Today the community is getting ready for a traditional wedding, so we walk around and admire their skilled textiles and handcrafts without interrupting their setup. We are quickly welcomed by a group of women standing in line waiting to demonstrate the traditional way of making textiles. Dressed with elaborate red and green sweaters, black skirts, and white and red headpieces; they demonstrated the elaborate process of turning Alpaca wool into threads, how to color them with natural dyes (form flowers, fruits, and minerals; and how using lemon or salt can drastically change the color of the dye), and finally the painstakingly process of weaving the multicolored threads to create an artistic textile. This is such an interesting and complex process that I still can’t understand. When you look closely at the textile art, there is a meaning behind every detail and figure in the weave. Peruvian iconography is a very strong and highly developed cultural expression – it dates back to the time when the Incas had power over the region. In the end, it was inevitable purchasing high quality textiles directly from the skilled women who weaved them. 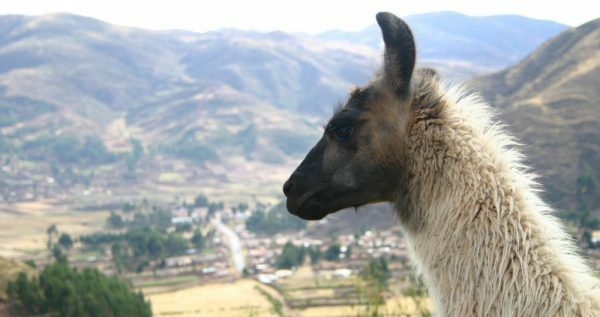 The next stop is the town of Pisaq – 27 km away from Cuzco. The impressive terraces of Pisaq’s ruins ribbon the mountain slope and are crowned with a complex of reddish rock ruins. As I get closer to the ruins, I grasp the full expanse of the golden valley, surrounded by its brownish dry mountains. Fernando –our Gap Adventures guide– showed us around the ruins; explaining detail by detail the meaning and purpose of each space, important stones, and moments in the history of Pisaq. This place was a strategic watch point and easily defensible fortress, but after the fall of the Inca Empire, local villagers plundered the ruins for building materials. As we poked around its many spaces, looked through its windows, and walked through its alleys; we got the true significance of this place everyday life. Behind the ruins, a pocked cliff full of ancient tombs serves as an astonishing background to the ancient ruins. We hike through Pisaq’s paths until we reach an observation point where the valley’s view is even more impressive. Standing in front of the group, Fernando explains the various communication methods the Incas used at the time– among them, sound. “You want to try it”, Fernando tells us with a big smile. Eager to know the outcome of the experiment, we instantly shout in unison, “HELP!”, not thinking about the possible reaction to the screamed word. Not long after we all stop shouting, I hear the clear echo reverberating through the mountains and valley, traveling distances I would have never imagined the human voice could reach. Now it’s time to head to Ollantaytambo, but before, we have lunch at the Blue Llama at Pisaq’s Market. This market is a huge complex filled with small kiosks selling textiles, souvenirs, produce, iconographies, and everything in between. It is lovely, but for me, it feels like a tourist trap. The afternoon casts its soft rays of light as we head to Ollantaytambo – our last visit of the day and our stay for the night. If Pisaq is impressive, Ollantaytambo is something unexplainable; something I would only expect to see in a J.R.R. Tolkien fictional world. 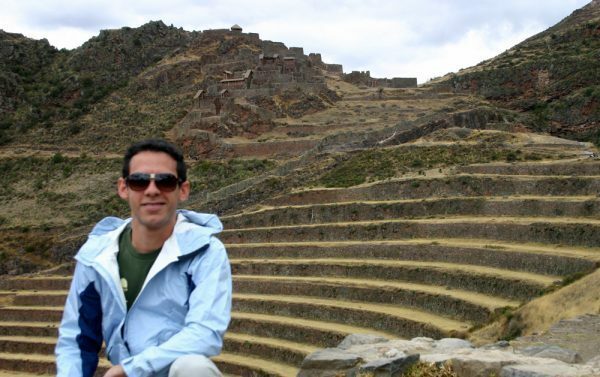 Ollantaytambo, located 68 km from Cuzco, is a small Incan town destroyed by the Spanish around 1536. Today, this place serves as a living museum and is the first taste of what lies ahead on the Inca Trail. It contains the remnants of a strategically situated town and fortress overlooking the Urubamba River Valley. 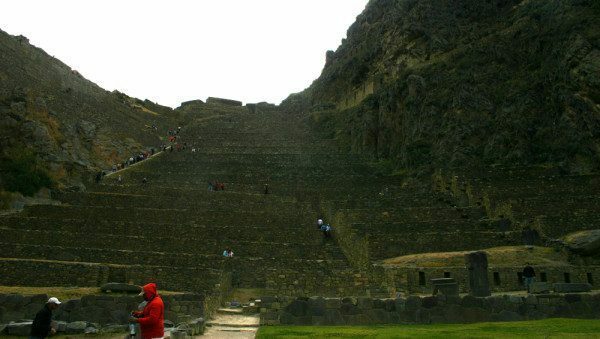 These ruins are known as the best surviving example of Inca urban planning and engineering, as well as being one of the few places where the Spanish lost a major battle during the conquest. The town was slowly rebuilt following the old Inca foundations. You can clearly see the difference between the Inca stone foundation and the Spanish wall extension. 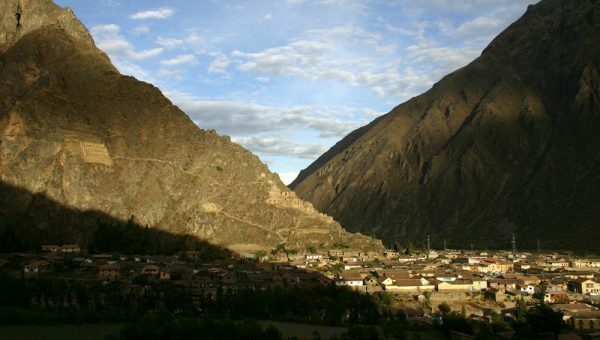 Many of Ollantaytambo current inhabitants are descendants of the original Quechua settlers. Adjacent to the town, the ancient temple-fortress of Ollantaytambo rises from the base of the mountain, forming an immense solid terraced wall with fortified gates, guardhouses, and steep slopes. A set of huge stepped terraces guard this Inca Fortress; making a potential attacking force feel weak and crumble under its juggernaut defense. My exploration through the fortress makes me feel like a little kid playing with a new toy, trying to find every hidden space, understanding every detail, and getting the most of it. The fortress was divided into two main areas, the popular and the sacred. You can clearly identify each area by the height hierarchy and the stonework. The construction ranged from rough rocks with mortar walls to smooth, perfectly pieced together walls where not even a knife can go through the mortar-less joints between the rocks. I find it hard to comprehend how the Incas could build such a fortress (as well as their entire empire) without the discovery of the iron, wheel, and without having a recorded written language. How? Fernando points to a hill at the other side of the river, approximately 3 km away from Ollantaytambo, “it’s believed that was the quarry.” Some of the stones are 12 ft high and can weight over 100 tons. “They must have been pushed down the mountain, gotten across the river, and then dragged uphill”, he says, as he continues, “imagine this, carving each stone could have taken around 40 days to a single man, and the whole Inca Empire (as we know it) was built in around 100 years.” Imagine that? Clearly, there was a huge workforce composed of thousands of workers. We walk down the fortress into the town and we finish our day early with a delicious dinner at the Blue Puppy. Tomorrow the Inca Empire exploration will be more intense. Tomorrow I will set foot on the Inca Trail. Great post Norbert – looking forward to the rest of the series. We have spent quite a bit of time in South America but have yet to hike the Inca Trail. It has been on our list for quite awhile and your blog entry just moved it closer to the top. The “Pisaq’s Market watercolors and dyes” picture is amazing. 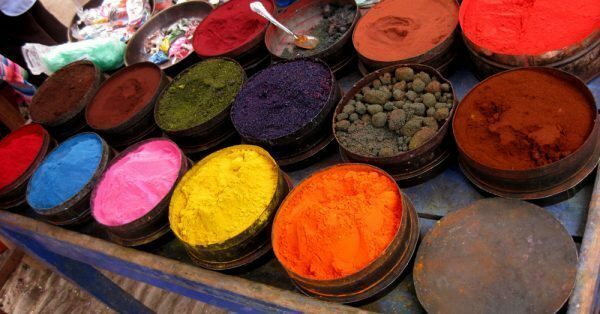 Yep, the Pisaq watercolors and dyes pic jumped out as me as well – great pic! Sounds like a really nice “warm-up” day – bet it gets harder from here!! @Christian and @Tandem – Thank you so much! It is really amazing watching the whole process of creating the dyes. Yes, this was a warm up… It gets tougher from this point on!! SO SO SO SO SO AWESOME!!! I wan to hike it too, but we ran out of time. Thank you Sarah! I’m glad you liked the post. Yes, I fell in love with Ollantaytambo. The little Inca town with the fortress next to it are really impressive and very contrasting with one another. With all honesty, Peru surpassed ALL my expectations. I’m still so excited about it and I already want to go back! Hiya Norbert, this has got to be one of my major bucket list places. Glad you managed to experience this and the picture look fab! I’d really love to hear your thoughts on Gap Adventures, I’ve heard good things but they are so much more expensive than the others. Well, I’m really happy with my Gap Adventures experience. I had traveled with them before so I knew the quality of their service, but before choosing Gap I did some research and found really good reviews about the their Inca Trail tour… so, it was in the bag. True, they are on the top tier – price wise. I paid $750, which might seem a lot. But, that price includes the 4 days Inca Trail, a day visiting the ruins at the Sacred Valley (which some tours don’t include), three extra nights at hotels (2 in Cuzco, 1 in Ollantaytambo), all the local transportation (including the train from Aguas Calientes), a porter that will carry up to 6kg of your personal stuff (which separately costs $40), and last but not least, an excellent service and delicious food (while on the Inca Trail). I have also read a lot of good reviews about Peru Treks. They are cheaper than Gap ($465), but they don’t include the Sacred Valley, hotel accommodations, and extra porter. Still, I do consider them to be well priced, and an excellent option, if you don’t need those extras and just want to do the Inca Trail. Love the first picture of the llama real close up! The Inca trail is something I’m dying to do – luckily I’m off to South America next month so fingers crossed I’ll make it up there. Thanks for sharing.